The Roman Anglican: Baroque Wonder: San Carlo alle Quattro Fontane by Francesco Borromini. Baroque Wonder: San Carlo alle Quattro Fontane by Francesco Borromini. It is quite an usual winter afternoon here in the Eternal City; the sun is not too strong; Baroque sculptures shine under its feeble rays, while the many water features continue in their exciting yet constant cycles. Yet, this feeble winter light doesn't unveil all Rome has to offer. 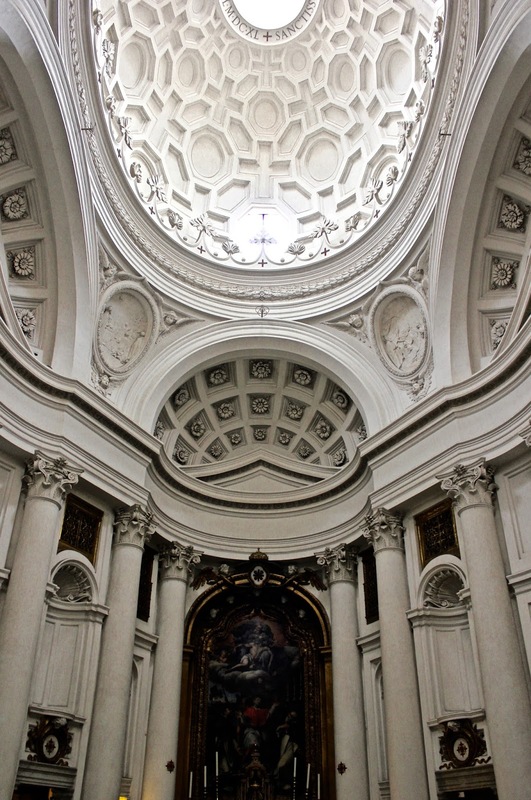 In fact, it reflects pretty much the darkest side of Baroque architecture: the art of Francesco Borromini. If we walk past the beautiful Piazza Barberini and the beautiful Palazzo Del Drago located just nearby, we'll find ourselves in a narrow square, surrounded by four fountains, here we find an interesting church, at a first glance it looks all over the place. 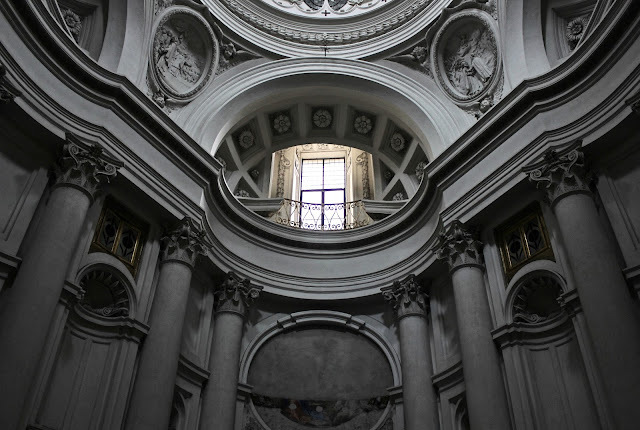 It seems to have too many curves and lines that seem to lead nowhere, but then it reveals a certain order, an opulent order which tells the glory of this Baroque age in the heart of Christendom. 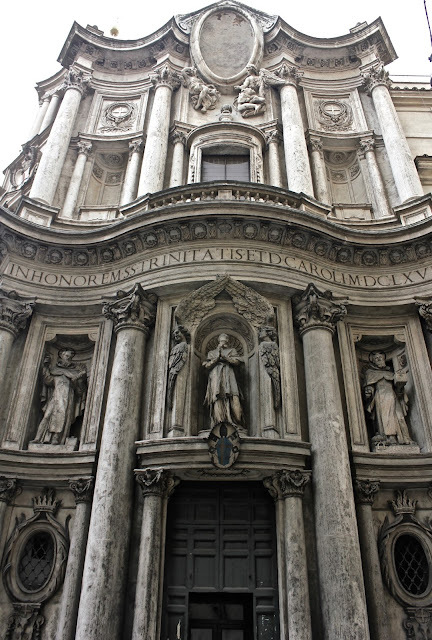 In this case we will explore Francesco Borromini's first church in Rome: San Carlo alle Quattro Fontane. 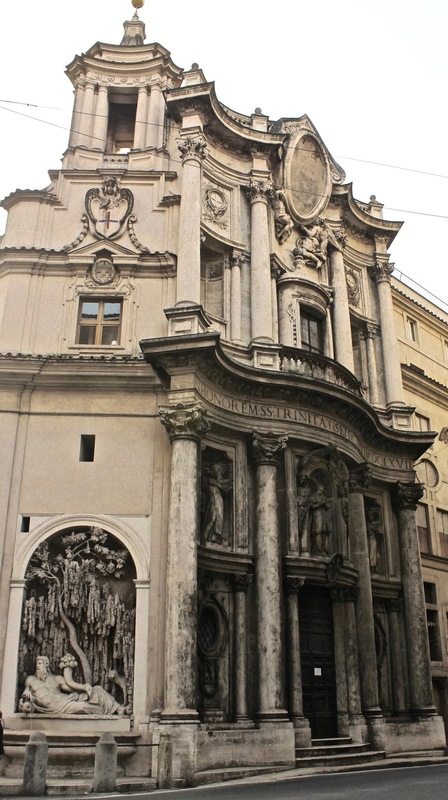 Built between 1638 and 1641 for the Trinitarian order and dedicated to Saint Charles Borromeo in 1646. The relatively tall façade of San Carlo has characteristic undulating lines, tall corinthian columns which define the framework of the two storeys façade, smaller columns give a sense of motion, on the top there is a medallion held by angels and on the lower level, statues of the patron saints of the church and the Trinitarian order to which it belongs: Saint Charles Borromeo and Saint Felix of Valois with Saint John of Matha. The church also has a cloister, both face onto the Via Pia. The facade seems to reproduce in a mono-dimensional way the interior. The church is relatively small and so it was nicknamed San Carlino (Little St. Charles) by the locals. The interior is quite spectacular and also very complex. There are two main stories as represented in the façade (although in a less well ordered manner) and the third which is the oval lantern. The high altar is on the same axis as the door and there are two altars on two niches on the two sides of the church. One altar is dedicated to Saint Michael de Sanctis and the other to Saint John the Baptist of the Conception. Around the altars sixteen columns seem to carry the building up on high, where the architecture becomes very undulating, where the niches become more and more and where the illusion of Baroque architecture reaches its highest form - it also gives a certain sense of mystery and awe which might be why certain art historians refer to Borromini as a "Gothic" architect, after all he grew up in the Gothic north of Italy. The rhythm of the architecture reaches a relative calm in the pendentives which forms with the nearby niches a sort of cross-like form that leads to the beautiful oval dome. 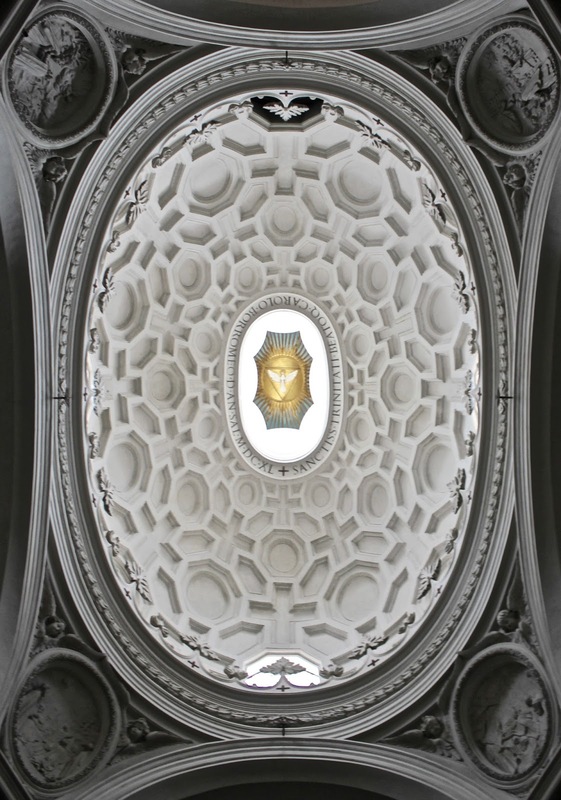 The dome has a "crown" of foliage and is framed with octagons, hexagons and cross that diminish in size towards the center, increasing the sense of deepness, very Baroque. Light floods in from the upper windows in a very mystical way, the lantern with the symbol of the Holy Trinity is the brightest area, the light fades as it reaches the floor - a symbolism that reflects the charism of the Trinitarian order. 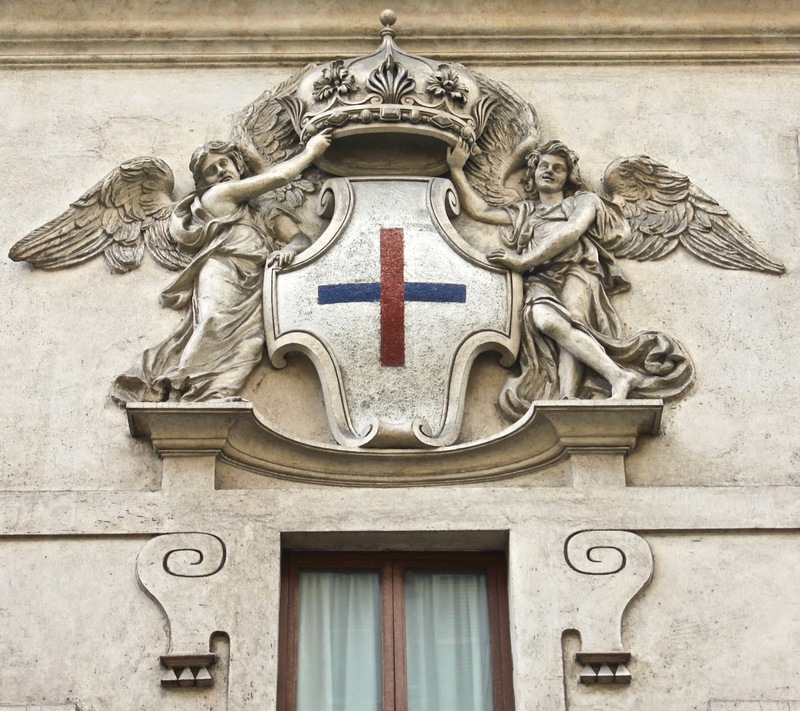 There are different doors that lead to the cloister, the crypt and to a little chapel outside the church, the Barberini chapel. 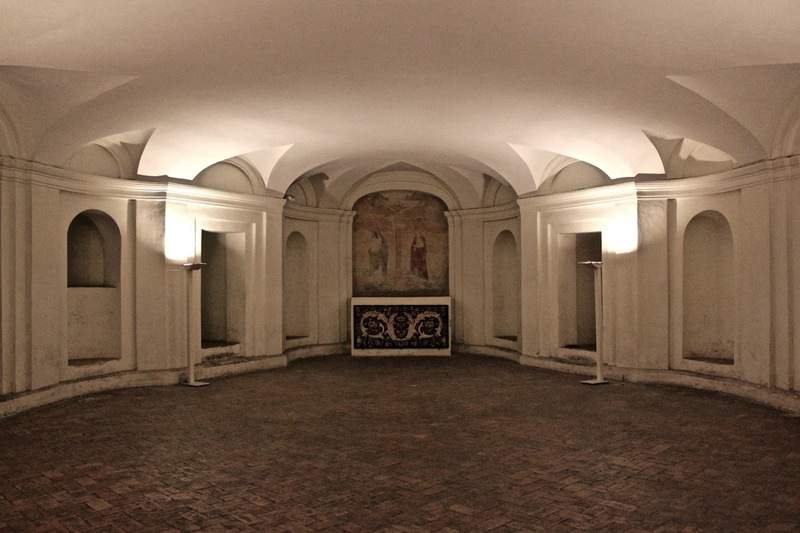 The crypt follows the form of the church but has a very low vault. 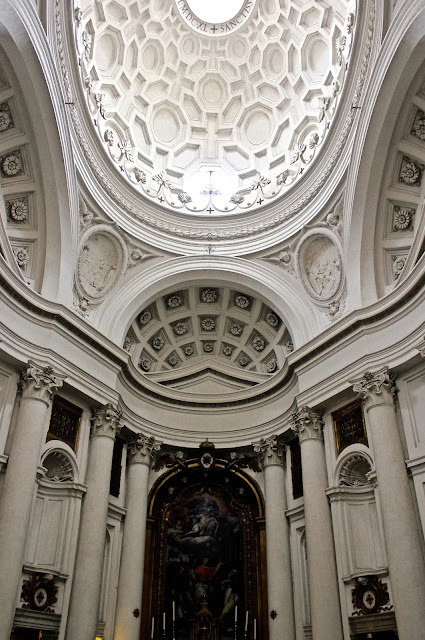 Little chapels open off this space, on the south-east side there is the one where Borromini intended to be buried. 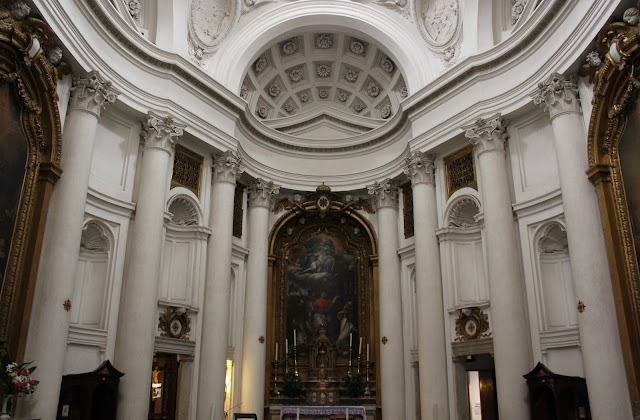 In here there are interesting Baroque marble frontals. The Cloister is another important feature of the church. It has a two-story arrangement, and it is longer than wider in an octagonal shape. 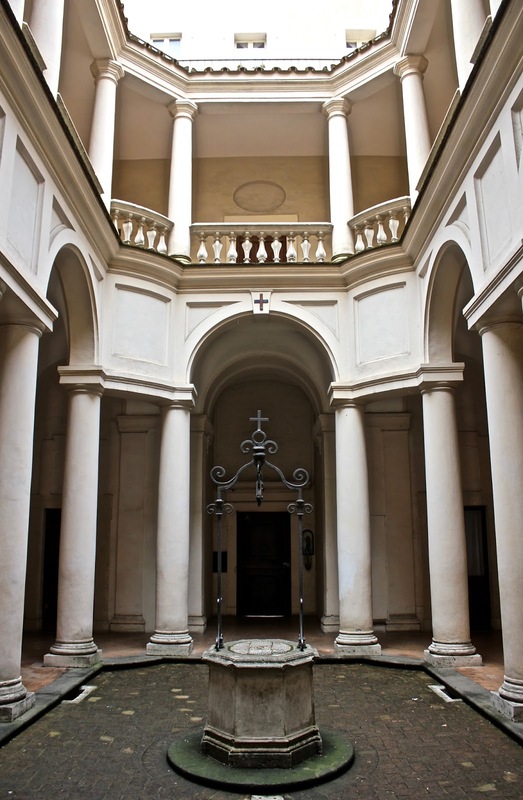 There are twelve columns, the curvature of the corners is interesting as well as the inventive balustrade. It is indeed a little jewel that is worth a visit.